Once again, News Corp. is threatening to hide itself from the rest of the Web. Earlier this week, Rupert Murdoch told an Australian interviewer that he might start blocking Google from the WSJ.com and his other news sites, even though Google accounts for about 25 percent of the traffic to the WSJ.com. Now his digital lieutenant Jon Miller is echoing his boss and warning that a move to block Google may come within the next few months. But he qualifies that by saying that News Corp must “lead” other media companies against Google for this to work. In other words, News Corp can’t go it alone. I’m not sure what other media companies, other than the AP, might be willing to follow. While the WSJ actually does quite a good job getting people to pay subscriptions online, and supplements that with advertising revenue to those paid subscribers, it is not clear how many other media brands can command that kind of loyalty. If Murdoch can get any of his newspaper rivals to once again retreat behind pay walls, it most surely will hurt them more than it will hurt Google. In fact, Murdoch is such a sly fox, it is hard to say who he is really going after here. By playing on his rival’s fears of Google becoming the new homepage for news, he might convince some of them to deny Google the ability to index their sites. He knows that the WSJ.com at least can survive on its own, and if the ploy doesn’t work out, he can always reverse himself. But you can’t help but suspect that all of this public strategizing is nothing more than a trial balloon to see if any other news companies are willing to come along on a Google boycott. Any such boycott, which would entail nothing more than requesting that Google stop indexing their news sites and thus become invisible to most people on the Web, will only hasten the demise of most of Murdoch’s rivals. Unless, of course, part of the plan is to turn to Bing instead and sell exclusive indexing rights for gobs of cash. It’s a risky move, however, because the WSJ and Murdoch’s other news sites could get caught in the crossfire as well. 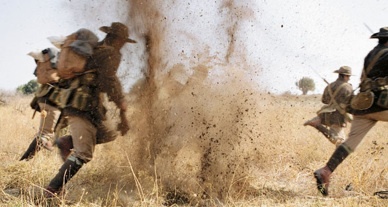 The notion of News Corp leading other media companies in this battle reminds me of the last scene of Gallipoli, the WWI movie set in Australia, when the infantry goes over trench wall, only to get slaughtered by the enemy. Col. Robinson: Tell Major Barton that the attack must proceed. Frank Dunne: Sir, I don’t think you’ve got the picture. They are being cut down before they can get five yards. Col. Robinson: Bloody line! Our marker flags were seen in the Turkish trenches. The attack must continue at all costs. Col. Robinson: I repeat, the attack must proceed! Charge! Hey, where is everybody?